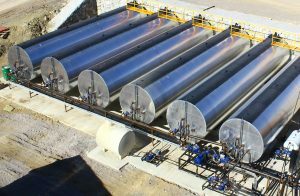 Horizontal or vertical type bitumen tanks with thermal oil or electric heating are available at desired capacities. External surfaces of tanks are insulated by rock wool and covered with aluminum or galvanized steel sheets. Bitumen and thermal oil feeding systems are designed by our Italian specialists for best performance. Complete feeding lines are manufactured and installed including thermal oil, jacketed or electrically heated piping, transfer and circulation pumps, valves, along with all sophisticated control devices.